When the going gets tough you just need to change gears and keep on pushing, so I did. After living in California for four months I had yet to see Lake Tahoe, although I had gone climbing south of the lake about two weeks after moving across the country. After working a few 60 hour weeks and getting rained out partway through my trip to Sutter Buttes the previous weekend I decided it was time to get away and check out Lake Tahoe. The lake is split between two states, California and Nevada. With the goal of keeping the lake on my right so I didn't have to look over a lane of traffic to get clear views of the water and mountains I parked my car about four miles away from the south shore at a trailhead for hikers near Fallen Leaf Lake. 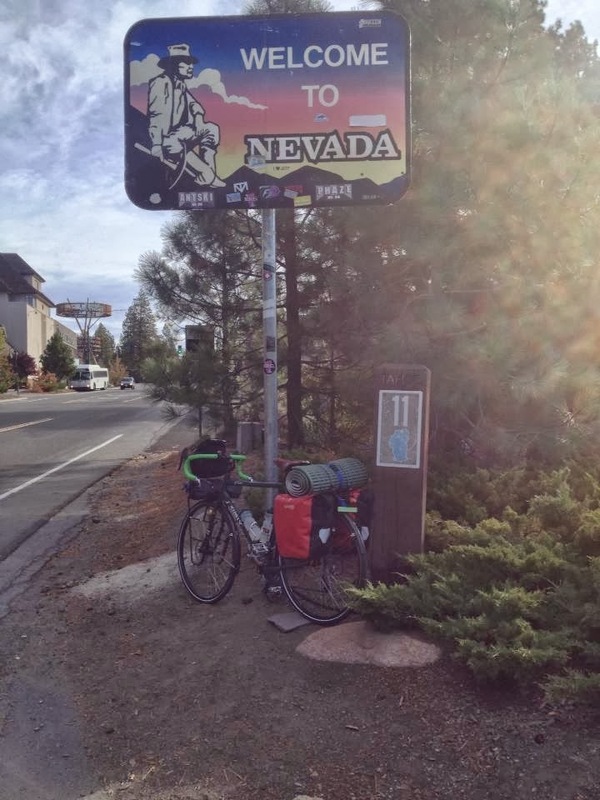 The actual loop around the lake is about 72 miles and can easily be done in a day; however, I wanted to camp out near the north shore so I ended up riding 40 miles each day. Finding a camping spot around the lake can be tough, but using WarmShowers for the first time made it an easy and enjoyable experience. The first views of Lake Tahoe are accompanied by a long and often steep and curvy climb to Emerald Bay, which was well worth the work by the time the 40+ mph descent to lake level was completed. With the wind at my back I continued rolling past Rubicon Bay and Meeks Bay. Climbing along Rt. 89 to Emerald Bay. Views from the Emerald Bay pullout. There were surprisingly few bicycles out on the road and biking paths that run along to the shoreline. The few that I saw were roadies cruising past me uphill and other riders giving the friendly nod going the opposite direction. Nobody else was loaded in any way other than a saddlebag full of gu gel, so I was getting some odd looks from drivers stopped along the road taking in the amazing views. Snow capped mountains along the east shore in the distance. 40 miles fly by and before I know it I'm at the address listed on WarmShowers, on the shore of Agate Bay. I had exchanged emails and texted with my host during the past week and knew that she would not be home until later that evening. Coming through the gate to the backyard I could not believe my eyes. People really live like this? With my bike leaned against the dock/deck, I walk down to the beach to take in the full panorama view. Camping spot for the night. Looking down to the south shore of Lake Tahoe. Paragliders flying over the Nevada side of the lake. Randi, my host for the night, finally arrived home from work and welcomed me inside for some pizza and beer. Her son just finished a cross country trip from Washington to New York passing through Canada and used WarmShowers along the way. This was her way of giving back. Randi insisted that I stay in the guesthouse instead of sleeping outside, but I couldn't pass up on the clear sky views and sound of the waves crashing along the shore. It had been dropping to 27F the last few nights but I was well prepared and didn't want to have carried all of my sleeping gear for nothing. The Therm-A-Rest cot kept me off of the cold ground and I was plenty warm, sleeping in only my biking shorts for the entire night. Testing out the Therm-A-Rest cot, sleeping pad, and sleeping bag setup. Sunrise from the sleeping bag. After oatmeal and eggs, a warm cup of coffee, and a quick chat I was back on the saddle and only a few miles away from the CA/NV border. Randi gave me a little tip to turn off on Lakeshore Boulevard instead of continuing on Highway 28 through Incline Village. The morning air was brisk, but it only took a mile or so before I had to take off my flannel and vest, zip off the legs of my pants, and throw back on my long sleeve jersey. Still riding clockwise around the lake I pass an overlook for Sand Harbor and decide to turn around to check it out. There were a few other people down along the shore and they start asking about my trip. Conversation ensues and I find out that they are visiting from Israel and have family in San Francisco. We chat for a little bit about my trip to Israel and favorite places in the country. Clear morning views from the road. A quick photo-op from my new Israeli friend. Back on the road I get a friendly honk from the Israelis as they pass in their rental car. Dense trees with huge pine cones thin out to reveal rock formations and pastures along the road, leaving plenty of room to catch a glimpse of the mountains and lake when the highway curves to the east. Highway 28 turns off to Highway 50 at Spooner Lake to reveal the most dangerous and scary section of the ride, from Glenbrook Bay until Zephyr Cove. Highway 50 becomes much more highway-like and the shoulder narrows. Battling a strong headwind I only reach 20 mph downhill and have to fight to maintain control when the gusts come from the side and push me toward the bumper at the ends of the road. Identifying peaks at a scenic overlook. The wind mellows out and the road becomes more biker-friendly after passing through Cave Rock, a tunneled out portion of road cutting through a rock formation that drops off to the lake. California comes quick and the welcome sign is nowhere near as large as the ones on highways back east. Casinos and ski resorts appear in the distance just as car and motorcycle traffic thickens. Highway 50 veers away from the shoreline and turns to Lake Tahoe Boulevard, a familiar sight that intersects with the road my car is parked at just over 5 miles ahead. Turning around to see Cave Rock after taking the lane to pass through safely. South Lake Tahoe casino skyline.